There is, of course, some not-so-good news. Unless U.S. negotiators manage to pull a rabbit out of a hat, those flights will arrive and depart only between 10 p.m. and 7 a.m. — which means that takeoffs and landings at U.S. airports may have to occur in the middle of the night, too. Access to Haneda is one of the issues being discussed between the United States and Japan as part of ongoing negotiations of an Open Skies Agreement. Washington has similar accords on liberalizing air travel with more than 90 countries, said John R. Byerly, deputy assistant secretary of state for transportation affairs, who oversees those negotiations. Mr. Byerly and his team last met with the Japanese delegation last month, and their next talks are scheduled for late this month. They have been “discussing some challenging issues involving slots at Narita and how do deal with the issue of flights between Haneda and the U.S. — something the Japanese would like to see,” Mr. Byerly said in an interview at the State Department. “We want to make sure that the competitive opportunities for U.S. carriers are equal to those of the Japanese airlines,” he said. Until 1978, Haneda was Tokyo’s only airport. When Narita opened, all commercial international flights were moved there, and Haneda became a domestic airport. However, travel time to Narita from Tokyo is about 1½ hours on average, depending on exact location and traffic, and can be very expensive. Transfers between Narita and Haneda can take even longer. Haneda, on the other hand, can be reached from central Tokyo in less than half an hour. 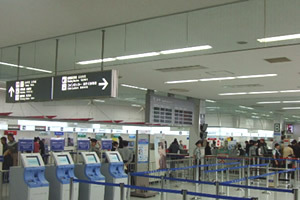 So after pressure from businesses and residents, in recent years a few short-haul flights to foreign countries such as South Korea and China have been added from Haneda — but with construction of a fourth runway scheduled to be completed in a year, the number of slots is expected to increase substantially. The Japanese government has already started to drive hard bargains with countries around the world for those slots. “They have given away the majority of the slots already in their negotiations with Canada, Germany, Britain, France, some Asian countries and others, so there will be a small number available” to U.S. carriers, Mr. Byerly said. Except for flights to and from several Asian cities, foreign airlines will have to use Haneda at night, he said. That may not be the most logical decision for most people, given that many airports — including Narita, which has a curfew from 11 p.m. until 6 a.m. — restrict night flights. But the Japanese government appears to have a different logic. “The thought in Japan is, during those core night hours, there is no international airport today serving the Tokyo region. Haneda, without a night curfew, can fulfill that role,” Mr. Byerly said. He noted some interest by U.S. carriers to fly to Haneda but declined to be more specific. According to people familiar with the issue, only Hawaiian Airlines is a participant in the negotiations with the Japanese. Hawaiian Airlines spokesman Keoni Wagner confirmed the company’s interest, even though it doesn’t fly to Japan. Other U.S. carriers do fly there. Delta Airlines “can’t comment on the issue right now,” said spokesman Trebor Banstetter. At American Airlines, spokesman Tim Smith said: “You never say never in this business, but we have no plans for Haneda at this stage. Historically, there are cost considerations if you split your operations at two airports in the same city.” A United Airlines spokeswoman didn’t respond to an e-mail message seeking comment. Haneda may not be too attractive for big carriers because many of their passengers connect to other Asian destinations, and for that Narita is the place to be. But when air travel recovers from the current slump, airlines may have enough Tokyo-bound fliers to justify using Haneda. For example, Washington Dulles International Airport may be United’s main East Coast hub, but it still has operations — however limited — at Ronald Reagan Washington National Airport. This entry was posted in Travel and tagged airport, American Airlines, Asia, Britain, Canada, China, Delta Airlines, Diplomacy, France, Germany, government, Hawaiian Airlines, Japan, negotiators, Open Skies, South Korea, State Department, Tokyo, Travel, United Airlines, Washington, Washington National Airport. Bookmark the permalink.